This Memorial Day weekend, my twin brother and I will be celebrating our birthday (never mind, which one) along with his graduating military school and continuing his education, throughout the summer, as a newly promoted 1st Sargent and, well, yes, we are ALL very, very proud of Steve! Hot Topic: Receive a 10% military discount by calling Hot Topic’s customer service number to place your order. Kohl's: Receive 15% savings on your purchase. IHOP: Receive a 20% discount with a valid Military ID. Johnny Rockets: Save 50% when you wear your uniform. Sears Portrait Studio: Save 20% if you show your Military ID at checkout. Barnes and Noble: Save 6% off the online price and receive free shipping when you order online. Call for assistance to receive the discount. Best Buy: Save 10% on your purchase with a valid Military ID. Lowes: Receive 10% off your purchase. Michaels: Some locations give a 10% off your purchase on Wednesdays. Walgreens: You may be eligible for a 15% discount with Military ID on certain days. Check with the store for rules. View the full list of military discounts, here. My sincerest thanks to GiftCardGranny for posting this awesome list, with special thanks and congratulations to my twin bro, 1st Sgt. Steve, and in honor of those who risked their lives to protect my family...HOOAH! Happy Memorial Day Weekend, everyone!!! My husband, Garth [not his real name] and I love attending open houses - especially, if it's a home that we've admired from the sidewalk, or wondered...you know...what the heck is going on over there? Same thing with blogs, right? So please, clean off a chair, sit down and feel free to share your links (PG-13, please) about any blogging events, fundraisers, giveaways, book tours and contests, or if you have a burning blog post and just need to a little shout out (HEY!) go for it! Joplin, MO was hit with a massive tornado that destroyed much of the town and left many people without homes. 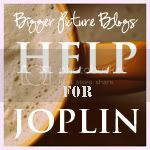 A community of writers has come together in support of one of their own (Sarah lives in the town of Joplin) and help the families of Joplin, MO put their lives, as well as their town, back together, again. Bigger Picture Blogs is hosting a charity auction today and tomorrow (Thursday and Friday) every hour (8 a.m. - 6 p.m.) another generously donated item will go up right here on their blog. Bidding on each item will start at $10 and increase by increments of $1. Please visit http://www.biggerpictureblogs.com/ for more information on this super fantastic blogging effort to help the good people of Joplin, MO! Thanks SO MUCH for sharing and feel free to come back, to see what my blogging friends are up to, next week (there's an open house held every Thursday) we'll leave the porch light on for ya'! Also, please feel free to clean off a chair, sit down, visit my parenting blog, ThisFullHouse.com and say "Hi," when you have time, of course! Behind the Scenes: Consumer Reports Live Facebook Chat - How Do They Test Gas Grills? I am SO ready to get in some serious backyard time, with the kids. Because, you know, they swear I am a MUCH better cook, in the summertime. Our grill, however, is borked (as in, so busted I have to use broken words to describe it) and, well, good thing my kids are old enough to roast their hot dogs over our fire pit. Are you looking for a grill? Or, do you Facebook? EXCELLENT!!! Tomorrow (Thursday, May 26th) at 1:00 p.m. ET, Consumer Reports is opening their doors (sort of) by hosting a live Facebook chat to take consumers behind the scenes of how they test gas grills. Do you Twitter, too? AWESOME!!! You will be able to interact with Consumer Reports testers and special guest food writer and chef Kenji Lopez-Alt (Managing Editor of Serious Eats) by submitting questions on Facebook and via Twitter with hashtag #CRGrills. Until then, I'll be hitting Google (hard) to see what grill everyone else is using and, you know, liking it, too. How about you? DISCLOSURE: No payment was received for this blog post. Just sharing stuff perhaps other families (like mine) would like, too. Every year the kids and I look forward to spending a portion of our spring break with their grandparents. Yes, my parents are okay with it because they are also perfectly happy to get outside, even if it’s less than an hour away from our house. Come by and visit with me at PlaydatePlace.com to read this freshly-brewed blog post and find out. I'll leave the porch light on for you, thanks! Take the family to Six Flags with Polly-O and KRAFT String and Twists! We invested in season passes to Six Flags (a.k.a. Great Adventure, if you're from Jersey) for my two oldest girls (17 and 15, respectively) last summer. A Season Pass pays for itself in less than two visits and the girls can attend concerts with their friends, all summer long, for FREE. My husband, Garth (not his real name) and I arrange for carpooling, with neighborhood friends, drop the kids off using special drive-thru lanes (i.e. NO parking required!) and then pick them up again in the shuttle parking lot. MORE WAYS TO SAVE: If you order 4 season passes by May 30th, you get a Season Parking Pass for FREE -- that's a $50.00 value! Take any specially marked Polly-O Strong or Twists package to a Six Flags location on weekdays and receive a free Kids ticket (under 10 years old) with purchase of (1) full price general admission ticket. The offer is good for $15 off full price general admission any day. Redemption is easy: Polly-O String and Twist package wrappers can be redeemed directly at the venue; and will be “upcycled” from there to help save our environment! Take any specially marked Kraft String or Twists package to a Six Flags location and receive $15 off full price general admission any day. Redemption is easy: Kraft String and Twist package wrappers can be redeemed directly at the venue; and will be “upcycled” from there to help save our environment! General ticket discount promotion runs from May 1st through August 31st, but redemptions will be accepted through October 10th. FULL REDEMPTION DETAILS AVAILABLE AT: www.KraftSixFlags.com or www.Polly-OSixFlags.com. Good luck and Happy Summer...almost!!! Disclosure: No payment, product, or any other consideration, besides a chance to share stuff I think families (like mine) would like, was received for this blog post. Yesterday, my family and I attended an art show, held at a local bank, supporting art in schools, featuring two of my oldest daughter's pieces. She's 17 and, well, as a mom of 4, it just brought to mind all of the refrigerator art I've proudly displayed, over the years. Also, I was reminded of an email I received from Operation Gratitude and how our troops LOVE getting drawings and artwork from kids in their care packages, too! Starting May 25 through June 15 we are inviting students in grades K-12 to draw or paint a picture that expresses their gratitude to our Military. All appropriate entries will eventually be shipped in our care packages to the troops. Grand Prize: $500 Donation to winner's school, an iPod and artwork placement on the Cover of the Operation Gratitude Magazine. Second Place: Digital camera and Operation Gratitude t-shirt. Third Place: Operation Gratitude T-shirt and keychain. All 10 Finalists will receive an Operation Gratitude DogTag and will be featured inside the Operation Gratitude Magazine. All entrants will receive an Official Operation Gratitude Certificate of Appreciation. Visit the Operation Gratitude blog for more details about how to enter, official rules and entry form. Disclosure: My twin brother is an Army 1st Sergeant, so I have a soft spot for Operation Gratitude and love sharing informaiton about their awesome campaigns. No payment was received for this blog post. Growing up with a twin brother, summer camp meant riding our bikes, playing basketball and exploring the surrounding neighborhoods, in Central New Jersey, until the street lights came on. Now, my family and I enjoy spending our summer weekends visiting with my parents on the Jersey Shore, or what all four of my kids lovingly refer to as Camp Mama and Papa. Today, I'm very happy to share author Danielle Feigenbaum's summer experience in Maine, along with some really great reasons why families (like mine) should consider summer camps, along with Maine Camp Director's Top Picks of favorite spots and activities, in Maine. Enjoy! Have you visited Maine, lately? Do your kids attend summer camp? Where does your family enjoy spending your summers? Disclosure: This Project You Magazine (www.projectyoumagazine) sponsored post was brought to you by "The Role Mommy Writer's Network." COMMENTS ARE CLOSED: So, so happy to be sharing with Thomas Hoh (#63) and Veronica Garrett (#48) please check your emails for further instructions !!! I am a featured blogger and Kmart Playdate Parent, which affords me the chance to review and/or share products available at brand stores owned by Sears. Today, we're featuring MyGofer.com, a FREE online shopping service offering a full assortment of groceries, prescriptions, health and wellness, beauty, everyday items, toys, baby supplies, pet supplies, electronics, appliances, apparel, home furniture and, well, really ANYTHING you need. Get it the same day through in store pickup at your local Kmart, curbside pickup, or home delivery. Also, I get the chance to share two (2) $25.00 MyGofer.com Gift Cards with our online friends. It's true! On Wednesday, May 11th starting at 12pm EDT, Coastal Contacts is giving away 10,000 free pairs of glasses to Facebook fans. My youngest is turning is 9 and on average I’d say she has a friend over or goes to a friend’s house once every other week, on Fridays (or “no homework” nights) after school. COMMENTS CLOSED: So, so happy to be able to share this with you Julie L (comment #7) please see your email for further instructions, thanks!!! One of my mother's earliest childhood memories is the day the Americans shipped a case of peanut butter to her kindergarten class in Hungary. Each child was asked to line up and receive his/her ration of peanut butter and, when it was my mother's turn, she shyly whispered into her teacher's ear that she didn't have anything to spread the peanut butter on -- the bakery ran out of their allotment of bread, earlier that morning. Growing up, my twin brother and I heard stories, like this, all the time -- especially, at the dinner table. Even today, I'm not ashamed to admit that our lives would be very different, if it were not for the charity of strangers. Absolutely the Last Possible Minute Mother's Day Gift Idea, I Promise! I know, I know, it seems like everyone and their brother is bent on reminding us that, you know, Mother's Day is just around the corner. Good thing, too, seeing as I may be the only mom, on the planet, who still does NOT have a gift, for my mom. No worries, we are a lot alike and enjoy simple things, so, I'm framing this picture of us, taken by my 15 yo, during spring break. It's one of the few photos my mom and I have, taken of each other, with each other, in the same photo and, well, we are both usually the ones, on the opposite side of the camera, taking pictures of everyone else. Hers is pretty beat up and I may, or may not have dropped it at some point, so I suggested to dad that the woman could use a new camera and, since then, I've been sort of elected to, you know, hunt around for one. Not an easy task (took me nearly two years to save up and find mine) however, this pretty little thing recently peaked my interest. The cool thing about this camera? The Samsung SH100 is...wait for it...WiFi-enabled...so, you can instantly share that pic of your husband, sleeping on the couch, with the dog, across your social networks to your friends and families anywhere. The mobile team is going to record all the amazing people they meet and the fascinating places they visit with the SH100, and the best photos and videos will be shared on the Samsung USA Facebook page! Personally, I'm looking forward to watching Samsung's campaign unfold, in real time and, as a potential customer, I'm very, very interested to see the final outcome, in pictures, as well. Hopefully, we'll see a funny face, or twenty and maybe even recognize some of the places, this pretty little camera takes us, so, yeah, this should be a REAL interesting road trip, right? Disclosure: I was compensated for this opportunity by Clever Girls Collective, which endorses Blog With Integrity. All opinions are my own.